Word of Mouth is a series where we get you guys onto cool things, via cool people. 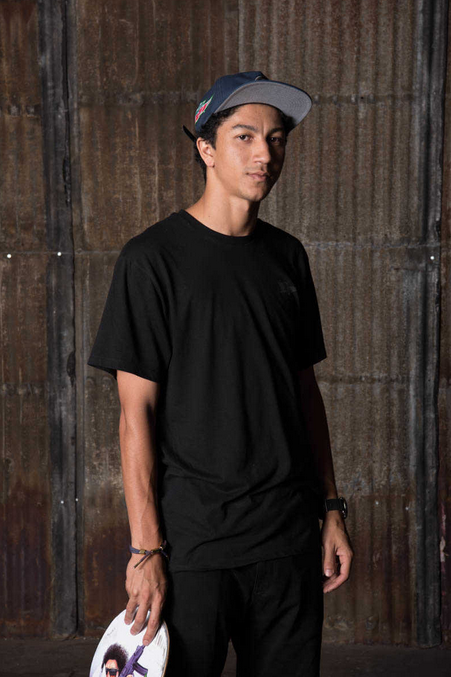 Professional skater Nick Tucker is living the dream. He travels the world with his childhood idol Paul Rodriguez (aka P-Rod) and the rest of the Primitive squad doing what he loves most: tearing up skate parks and refining his craft. We caught up with the 25-year-old who told us what keeps him motivated on and off the board. My cousin Eric Tucker, he’s into music. I’ve been listening to a lot of his stuff recently. He’s like the new generation of music. He’s more R&B [than rap], and he’s been playing good music for as long as I can remember. I’d say he’s pretty similar to Bryson Tiller. I mean, everyone has their own sound, but in terms of comparisons, I’d say he closely resembles Bryson Tiller’s style of music. He’s on SoundCloud and Instagram, and he’s got a band called Dyles Mavis, so check him [and them] out. Everybody should read Rich Dad Poor Dad [by Robert Kiyosaki] at least once in their life. It’s about a kid who grows up and he pretty much has two dads, one biological dad (the poor dad) who suffers through poverty and various economic problems. Then there’s his best friend’s dad, and the friend’s dad pretty much became the kid’s second dad (the rich dad). He learned from the rich dad about how to grow his finances and what people should do to become rich and how they stay rich. The book shows you both perspectives, which is really cool. Stretch all the time. I go to the chiropractor quite a bit. I would just say keep up with your body, dude. Stretch all the time, eat good, get enough sleep, don’t get too crazy while you’re partying. Just pay attention to your body. And I definitely try to watch what I eat. I try to eat a more vegetarian-based diet. I eat meat still, so I’m not saying I’m full vegetarian cause you gotta get protein. But greens are important. I drink a lot of smoothies and take ginger shots and wheatgrass shots. I’ll even mix a little Mountain Dew in there. Something that Paul Rodriguez told me, and I’ve lived by it ever since he did, was never ever, ever take your foot off the gas pedal. Never get comfortable and never feel like you’ve done enough because that’s when you start to slip. You always gotta be working twice as hard, four times as hard, and you always have to think as if you’re still—no matter where you’re at—trying to get your foot in the door. Shot on location in Jaguariúna, São Paulo, Los Angeles and Long Beach, the film contains never-before-seen archival footage, and shows how at just 25 years old, Tiago has already made a mark on skateboarding, bigger than even he realizes. Check out more at www.greenlabel.com/tiagolemos.